To save the environment and reduce the use of detergents, we suggest that cloths and mops which are slightly dirty, or embedded with grease, be washed with a little dish detergent under warm running water and used again before laundering. You DO NOT have to wash with soap after each use if not dirty, but you should always rinse under warm to hot running water. Launder microfiber cloths in hot water with other lint-free laundry using Norwex Ultra Power Plus laundry detergent (or other environmentally friendly detergent). Do not use bleach or fabric softener as this will destroy the product’s ability to clean effectively. To deep clean, remove stubborn stains or odours from smelly cloths, Norwex microfiber can be boiled for 10 minutes to allow fibers to swell and release the debris. Use our Rubber Brush to remove dirt and debris from the mops between launderings. Never use fabric softeners as they contain zeolite which will coat the fibers and diminish their static and capillary action required for high-quality cleaning. Traditional cotton cloth pushes around particles, spreading dirt, grime and moisture into the surface crevices, leaving it moist and unclean. 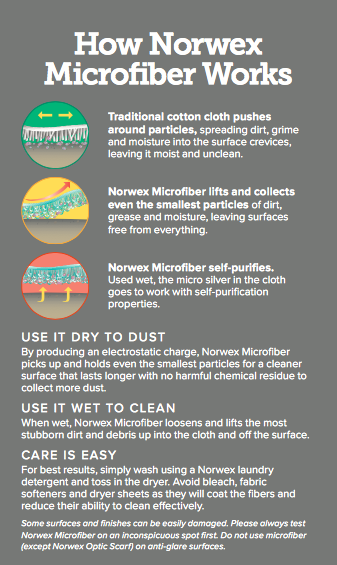 Norwex Microfiber lifts and collects even the smallest particles of dirt, grease and moisture, leaving surfaces free from everything. Used wet, the micro silver in the cloth goes to work with self-purification properties. Norwex Microfiber is super absorbent and cleans without ￼chemicals! Use dry to pick up and hold dust. By producing an electrostatic charge, Norwex Microfiber picks up and holds even the smallest particles for a cleaner surface that lasts longer with no harmful chemical residue to collect more dust. Dampen your cloth with water to loosen dirt and debris, leaving surface free from everything. When wet, Norwex Microfiber loosens and lifts the most stubborn dirt and debris up into the cloth and off the surface. For best results, simply wash using a Norwex laundry detergent and toss in the dryer. Avoid bleach, fabric softeners and dryer sheets as they will coat the fibers and reduce their ability to clean effectively. Some surfaces and finishes can be easily damaged. Please always test Norwex Microfiber on an inconspicuous spot first. Do not use microfiber (except Norwex Optic Scarf) on anti-glare surfaces. 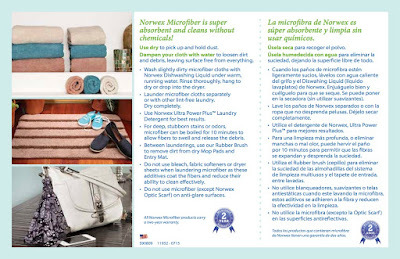 Wash slightly dirty microfiber cloths with Norwex Dishwashing Liquid under warm, running water. Rinse thoroughly, hang to dry or drop into the dryer. Launder microfiber cloths separately or with other lint-free laundry. Dry completely. Use Norwex Ultra Power Plus™ Laundry Detergent for best results. For deep, stubborn stains or odors, microfiber can be soaked in very hot/near boiling water for 10 minutes to allow fibers to swell and release the debris. Between launderings, use our Rubber Brush to remove dirt from dry Mop Pads and Entry Mat. Do not use bleach, fabric softeners or dryer sheets when laundering microfiber as these additives coat the fibers and reduce their ability to clean effectively. Do not use microfiber (except Norwex Optic Scarf ) on anti-glare surfaces.